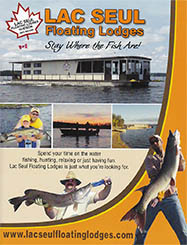 Lac Seul Floating Lodges - Hudson, Ontario: Frequently Asked Questions about staying and fishing with Lac Seul Floating Lodges. Please drop us a line and send us your request. Cancellations can be done by phone or email no less than 150 days prior to your departure date. Please see the Contact Section for contact details. What time is boarding and check-out? Boarding time is 1pm. Checkout is 8am. Boading time is 1pm. Please do not arrive early. Your boat will be returning from a previous booking and must be cleaned and groomed before we can release it to you. The houseboat is also checked at the dock prior to your departure to ensure everything is working properly. However, we are not responsible for loss of time due to weather, incidents, illness, or should by chance a mechanical issue occur. Our office on the waterfront in Hudson is where we check-in. Our facility has office space and a gift shop selling a variety of clothing and memorabilia. See our Location page for specific directions. A minimum deposit of $1000.00 must accompany any reservation for our 65, Super 65 and 75 and Super 75 foot houseboats. Yes. You must provide 150 days notice to receive a full refund. We accept cash, cheque, as well as Visa and Mastercard. If you are paying with a credit card, there is a 3% handling fee charged. Yes, we offer optional insurance with a $3000.00 deductible. Insurance does NOT cover willful damage or neglect, nor props or lower units on our houseboats or our fishing boats. Who is responsible for damage and repairs? Customers are responsible for any damage that occurs while renting any houseboat, fishing boats and motors. Lac Seul Floating Lodges, our employees and contractors are not responsible for any damage to or loss of personal property, regardless of the cause. On Lac Seul you will have the opportunity to catch; Walleye (Pickeral), Northern Pike, Bass, Muskellunge (catch & release only) and Perch. What is the lake water level? Depending on the amount of rain the water level can vary greatly. A great website to look at is the water level and flow information for Lac Seul website. Yes. Each individual fishing the waters of Canada must be in possession of a valid license. The license must be kept on your person while fishing. Both Canadian and U.S. residents may purchase a fishing license when you check-in. We have a computerized system for faster service. If you are returning, please make sure you have your Outdoor Card from the previous year with you. You can also purchase your license online. Our links page will help you find and purchase your fishing licence onine. Where can I get bait (minnows etc.)? We recommend that you place your order in advance, so that it is ready to be picked up as you drive to our dock. Yes, this is part fo the Canadian wilderness after all. We highly recommend that you bring a good bug repellent and mosquito coils. What temperature range can I expect? Summer daytime highs are normally above 25°C (77°F) and drop as low as 5°C (41°F) at night. Are there any restrictions to having camp fires? Maybe, it all depends on how wet or dry our summer has been. Here's a map of fire restriction zones to help you out. Our houseboats are fully furnished with all the comforts of home including cooking utensils, pots and pans. Bring enough food and beverages to last the week. This allows more time to catch the big one instead of running in for supplies mid week. All of our houseboats have two refrigerators and a large pantry with more than enough room to stock a weeks supply of food. If you are joining us for a fishing trip, bring the fishing gear that you will need. Fishing rods, lures and minnow buckets. If you are coming during moose season, you will need your hunting gear and warm clothes as the nights are cool. All the houseboats are equipped with lifejackets. As per the Canadian Boating regulations, your lifejacket must be readily available and must fit. The lifejackets on the houseboat are adult jackets for chest sizes 35-50 inches and a weight rating of over 90 lbs. If you have children joining you on your trip, please bring the appropriate size of jacket for your child. 2 blankets, 1 flat sheet, 2 bath towels, 1 hand towel, and 2 face cloths. Some other handy things to bring along are cards, magazines, books, games, a GPS, insect repellent, sun screen, swimming gear, a portable radio, rain gear, camera, warm set of clothes, binoculars, and a flashlight. Cell phone coverage on Lac Seul is limited. Some of our guests choose to bring a portable satellite phone. Prior to your arrival, you are required to fill out a questionnaire detailing your party and your needs/requirements. You may download our questionnaire here if you have misplaced it or wish to have a digital copy. You will not need a passport to enter Canada. You will need proof of your citizenship, such as a birth certificate, certificate of citizenship or naturalization, as well as photo identification. However, the United States, as of June 1, 2009, requires either a passport, passport card, an enhanced driver's license or a "Trusted Traveller" program card in order to enter. You can find further information on admissibility into Canada at the Visitors to Canada website. Further information on returning to the United States can be found at the United States Customs and Border Protection website. Can I bring pets across the border? Yes, with limitations and restrictions. However we DO NOT allow pets aboard the houseboats. Can I bring hunting weapons across the border? Yes, with limitations and restrictions. See the Visitors to Canada website for more information. Can I bring my kids across the border? Yes, with proper identification. See the Visitors to Canada website for more information. Can I bring tobacco and/or alcohol across the border?